Do you know what happens to the oldest street in the Philippines at night? From a bustling city traffic, the Colon street in Cebu City transforms into a lively night market. This brings back the street’s old glory which was the center of trade and commerce several decades ago. 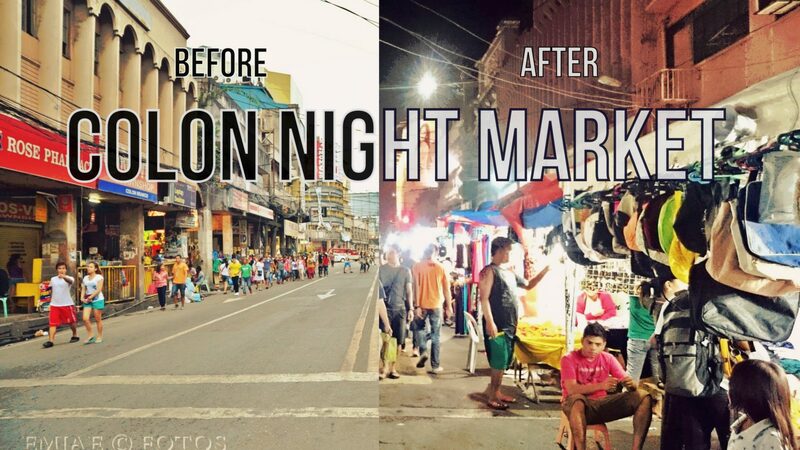 The Colon Night Market is a program initiated in 2007 that turns the busiest street in Cebu into a trading place just like the Divisoria in Manila. Here you can find a wide range of goods and stuff for a low price. The street starts to get crowded at around 6:30-7PM where the traders start to pitch their tents and display their products. Vehicles are then re-routed so people can walk through the 3-block stretch of the market. By the way, the night market does not happen all year round. It is usually held around Christmas-Sinulog season from December to January and also during the Cebu Business Month and start of classes in mid-May to June. It’s a good opportunity for small scale businesses as well as bargain shopping for the consumers. Wear casual outfit. Be comfortable. Blend in. Bring cash, leave your cards. Keep your bags closed. Don’t show off your jewelries and gadgets, those are eye candy. Here you can find bags, clothes, electronics, accessories, toys, fruits, dry goods, school, office and household supplies, decorations and “everything under the sun”. And if you’re hungry, there are a lot of food stalls and street foods you can try. (Before) At McDonalds 2nd floor, my favorite spot. How about a virtual tour of the Colon night market. Lucky for you I still have my phone after that night and I get to create this street view map using Photosphere. It’s a 360 degrees view experience and you can drag around up, down, left or right. I’ve been a patron of the night market back when I was still studying at USC-Main. There are pickpockets that’s true so one should do well to clutch their bags! The experience is still fun. Plus, the deals you get are pretty great too. Check out the Colon night market and find some of the best bargains in the city. What a fascinating and creative walkthrough! I love the before/after presentations, it’s a very creative way to showcase this street. I’m scared to go to Colon by myself, though D: My friends in college were always raving about the night market and it does look like an interesting bazaar! lovely photos! You’ve captured a great angle of my new home CitySavings! hehehe Colon isnt scary at all compared to Recto.. The Colon STreet stretch has definitely changed a lot with the entry of new and modern shops. And the night market seems to be a bit more organized in a way they arrange the vendors compared to before! The idea of making Colon street a bazzar at night is highly commendable as it breathes life to this Philippines oldest street. BTW I like the one at McDonalds 2nd floor shot. I wish you could have included the gastronomic flare near UV, which is my favorite spot in the this night market. But as always, stellar photos mate! Grabe! This place looks awesome! The only reason why I don’t visit Colon Street Night Market this much anymore was due to a very bad experience when I almost lost my cellphone and wallet while roaming around the streets. Though I grew up in one of the most notorious areas in Cebu [Villagonzalo 2], I still had this fear of being snatched by a very skillful individual. Several times when I was in high school, I usually end up snatched by a teenager either with my earrings, my necklace or worst, my bag. I mean, it’s very tiring to chase the perpetrator and just end up being laughed at by the bystanders while I was on my USC Girls High long sleeved uniform and sky blue skirt. I could have asked help from my fratmen cousins but I don’t want any wrong move. But your post changed the way I looked on Colon by night time. Sometimes, there are fears that cannot be easily wiped out from my memory. And that includes Colon by night. I often go to Colon to buy cheap stuff like clothes. My current go-to shopping tambayan is, correct me if I’m wrong, 138 Mall (iformerly Fairmart). And you’re right about having extra precautions with your valuables as the thieves frequenting that area are very cunning and heartless. Haha, visited this place last Saturday and it’s a major transformation at night. I was drooling with the street food but we were on a hurry that time. Ka amazing sa virtual tour! Hehehe. Colon is like “my street” now.. LOL. I wasn’t comfy before when walking around because of you know na and I’m not originally from Cebu but my husband who’s a Cebu local taught me how to go around and which places to avoid. I needed to learn because it’s my jeepney stop when going home. Lingaw ang night market esp the street food but I always get pissed if my work schedule is around 7pm kay dugay kaayo ko makasakay because of the rerouting. Haha!